Inshallah this is a technique which will be useful to all of you after I leave your physical presence and go away. You will be in need of this technique. In this life, our physical meetings shall come and go. It is not possible for a person to always be in company with another person, whether they be husband and wife, parents and children, brothers and sisters or among the most beloved one. A person may never desire to be far away from his loved ones. However, it is written that it should take place, Kiraq, means separation and at sometimes everyone must enter and depart. As far as our physical bodies are concerned it is written that we cannot be together always. It is just not possible. However, spiritually we have been given a power and technique by Allah Almighty to be always together at anytime that anyone may ask for such a meeting. This is possible because our spirituality has a possibility to be in connection. When we remember that person, our spiritual being always will be able to be in such a connection with that person. These connections have so many levels. Perfect Awliya are always in connection with RasulAllah (peace and blessings be upon him and his family). Anytime they want such a connection they should find themselves immediately in the holy presence of RasulAllah (sal lallahu alaihi wa salam). They never leave RasulAllah’s spiritual presence. This technique is known as Hudhur Ma Rasul – that is; connection with the Holy Prophet upon whom be peace, people belonging to Tariqat are stepping in this direction to obtain such a connection. As we are just beginners, we should first practice an easy way. This easy way is Hudur-Ma-Shaykh; that is to be in connection with your Shaykh*. Anytime that you think of your Shaykh, you may say “I am in the holy presence of my Grand Shaykh”*. At first you may not see him, but a feeling of his presence may be felt by you. These feelings are of different levels. A simple connection is to feel your Shaykh’s presence always then gradually you may come to the level of feeling the breathing of your Shaykh. Then further on you may see your Shaykh in front of you making the Dhikr ‘Allah, Allah’ and thereby giving power to you and you look at him and follow him. Then you will be present with your Shaykh for your entire life. Thereafter you shall find yourself in the presence of the whole circle of the lovers of your Grand Shaykh. Then when that connection becomes perfect you will be able to see your Shaykh sitting with you, coming with you, going with you, being with you, being in you and surrounding you, then the Shaykh shall be in you. You will then become changed to the personality of your Shaykh. That is known as Fana-u-fi-Shaykh. You will leave your being and the personality and power of your Shaykh will appear through yourself and then you become the Representative of your Shaykh. Then, your Shaykh, through that personality will take you to the Holy Presence of RasulAllah (sal lallahu alaihi wa salam). Then RasulAllah (sal lallahu alaihi wa salam) will dress you in his spiritual body and then you will become the Representative of RasulAllah (sal lallahu alaihi wa salam). RasulAllah (sal lallahu alaihi wa salam) is Dhahir, He appears through yourself. Then, RasulAllah (sal lallahu alaihi wa salam) will take you to Hudhur-al-Haq (the presence of The Truth, to the Divine Presence of The Lord Allah Almighty). Allah Almighty will then dress you with Divine Light and then you become annihilated in Allah (Fana-u-fillah). Then you will be leaving everything in yourself and Divine Lights will appear through yourself and you will then become Khalifatullah (Representative of Allah). You shall then represent Allah to the whole universe and then He shall give this power to you (ayat) “tassarusal tasliq”– that is to be able to do everything throughout the whole of creation and through all the universes according to His Divine Will. That is Khalifatullah. All the Laws and Shariat that has been sent down through the Prophets and Ambiyas are to teach people and guide people to this station. When you reach the station of Khalifatullah, you achieve the final aim of all Shariat and all Tariqat. *With the passing of Mawlana GrandShaykh Nazim al-Qubrusi in 2014, all Hudur Ma Shaykh and Rabitah Sharif creative imagination meditation exercises should be directed to ‘Ali b. Abi Talib or Abu Bakr al-Siddiq as they were from the early stages of Islamic history. 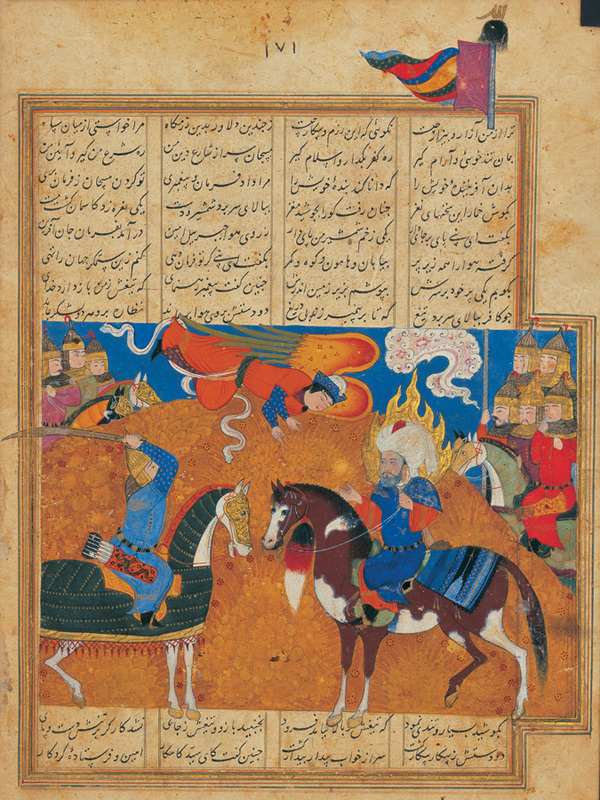 Ottoman manuscript page from vol IV of Ḍarír’s Siyar-i Nabí. 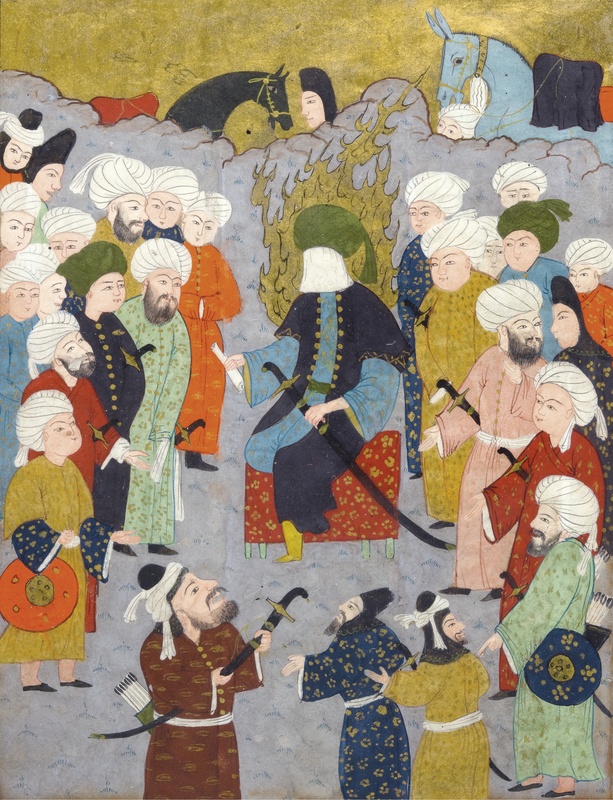 Illustration depicts the historical moment in which the Prophet Muhammad blesses Imam Ali and Hamza as they engage in the battle of Badr (AD 624). A decapitated man lies in the foreground, while armoured men await on either side of the central hill (a single palm tree stands high). Two lines of text appear both above and below the illustration. Opaque watercolour and ink on paper. The British Museum. The first four Caliphs of Islam (Abu Bakr, Omar, Othman and Ali). 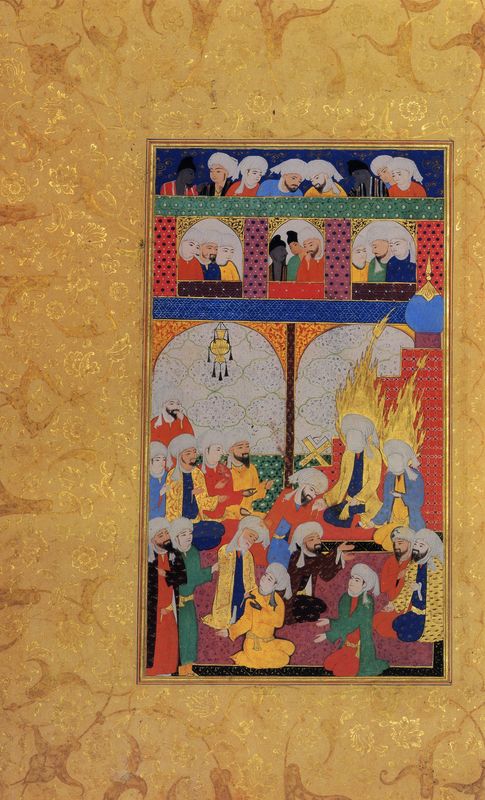 Turkish miniature, 16th century. Turkish and Islamic Arts Museum, Istanbul, Turkey. 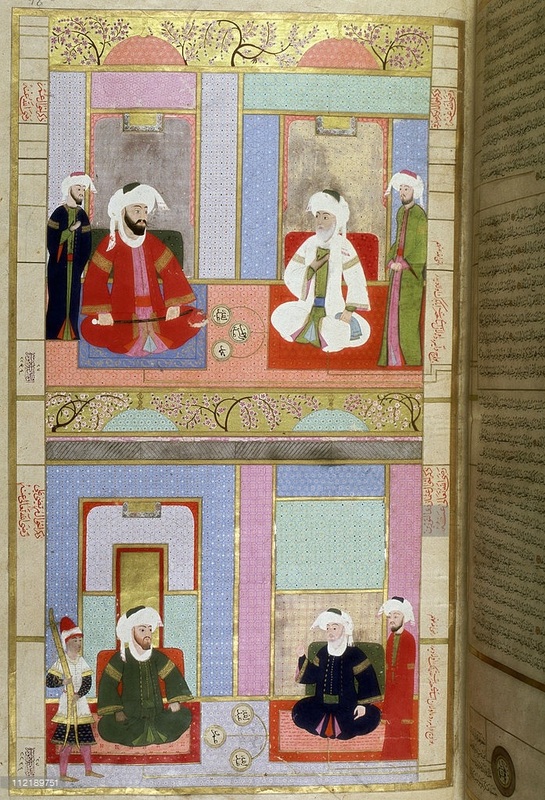 An Illustrated and Illuminated Leaf from Muhammad Ibn Suleyman’s (known as Fazuli) Hadikat al-Su’ada (‘Garden of the Blessed’): Imam ‘Ali and his Council, Ottoman Baghdad, century. 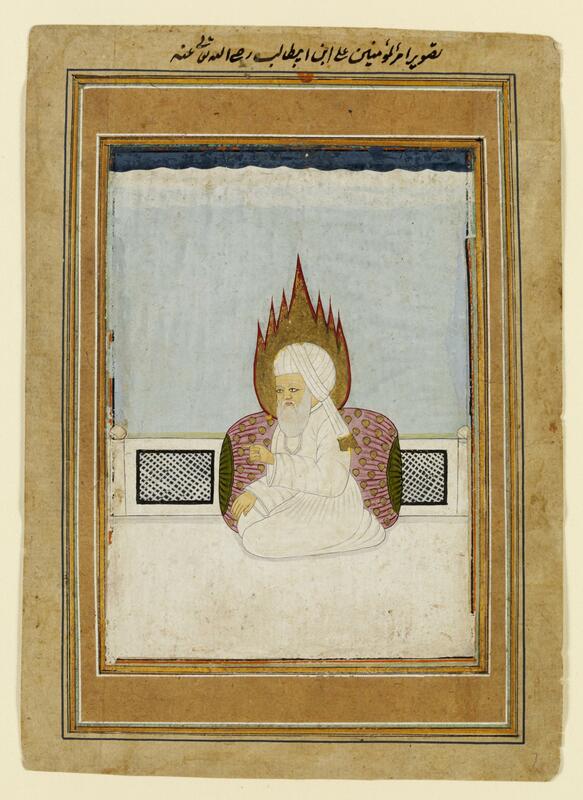 Imam Ali with flame halo. 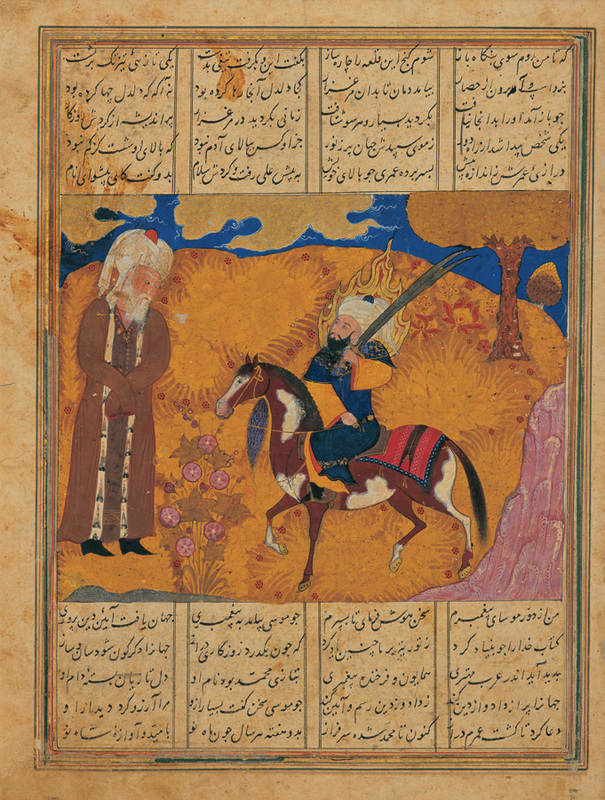 Gabriel enters the battleground 15s Farhad Shirazi. 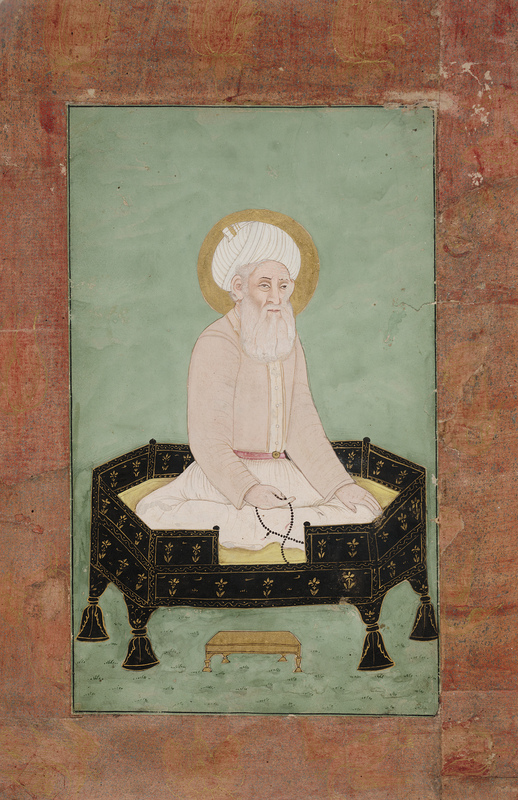 Painting, Imam ‘Ali, opaque watercolour on paper, South India, early 19th century. Victoria and Albert Museum, London. 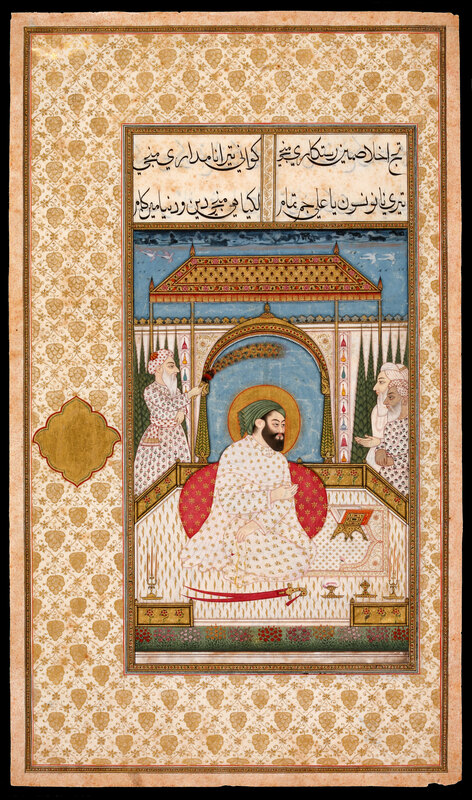 Founder of Tariqa Sufism Ghaus al-‘Azam, Abdul Qadir Gilani of Baghdad, c. 1800 (gouache with gold paint on paper) Deccani. This entry was posted on December 7, 2011 by ASFC in Ahmed Amiruddin and tagged Hudur Ma Shaykh, Rabita Sharifa.